1. 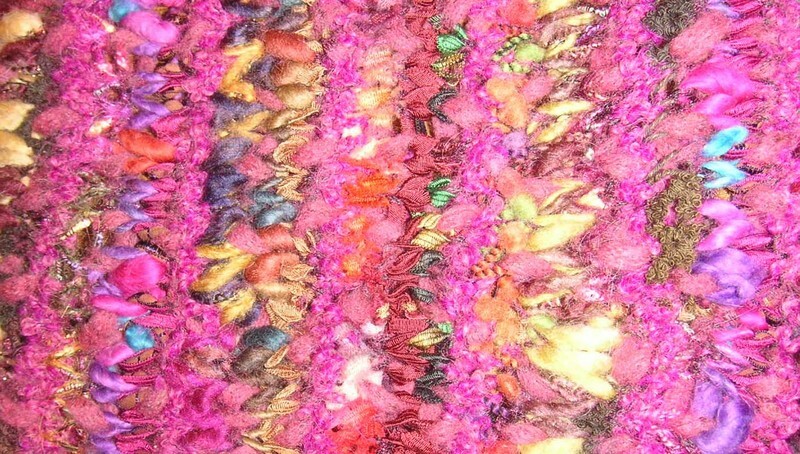 To knit with a reverse stitch. 2. Thread made of twisted gold or silver wire. 3. To flow with a curling or rippling motion as a shallow stream does over stones. 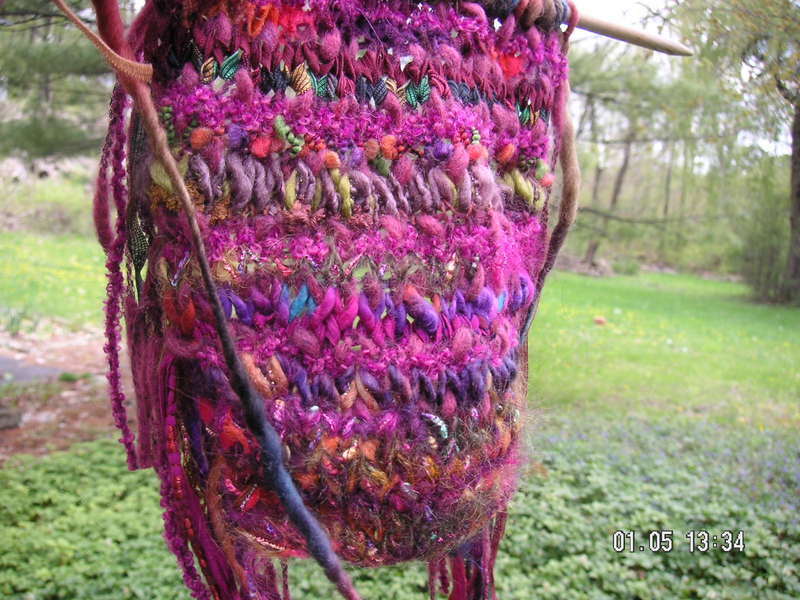 Random murmurings on knitting, with occasional digressions, by an oblivious dreamer who finds herself tripping through life. For more projects, check out my sewing blog as well. Share book reviews and ratings with Mardel, and even join a book club on Goodreads. Wine&Roses cardigan, no pattern. 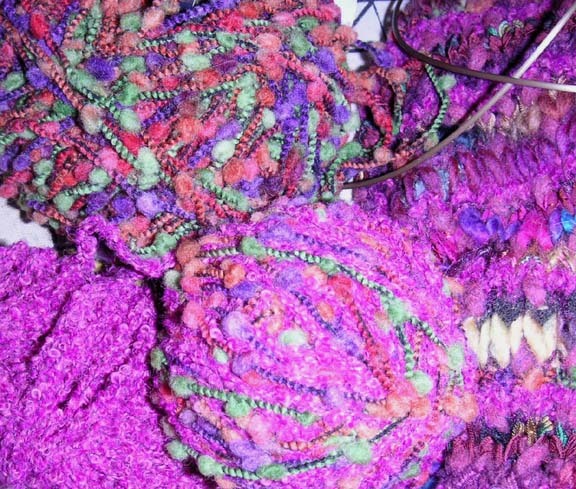 Mixed yarns. Admittedly not the best photograph. Matilda's lack of arms does nothing to enhance the shaping at the sleeve cap or the sleeves themselves, which nicely hug the shape of an actual arm without being tight. The problem here is the differing gauges and natures of the multiple yarns. Unfortunately although the sweater shows off some of Matilda's asymmetricalities, mine today are even greater, so you will have to live with the armless wonder. We all have our vanities after all. 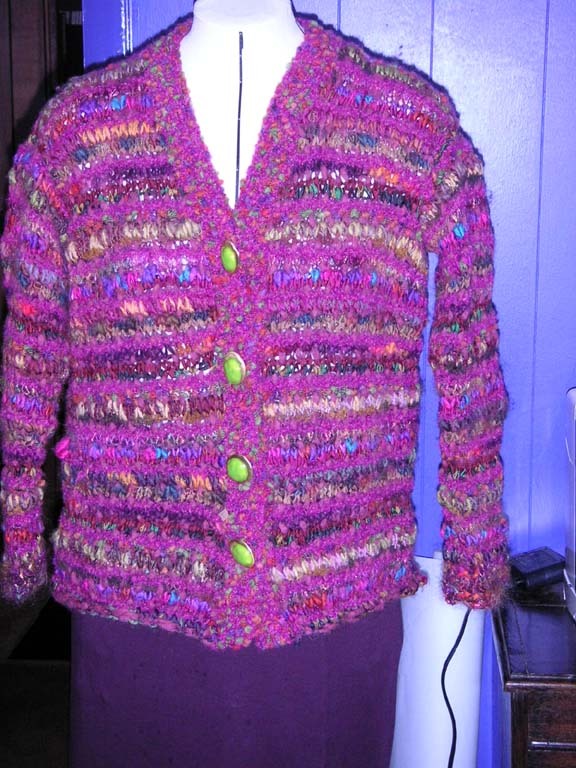 This cardigan started with several skeins of Indecita Alpaca Boucle in color #19 fuschia. George and I were out driving around one day when we stopped at a little Alpaca shop and saw the yarn. We both really liked it, but they only had a few colors, mostly brows that would have been unattractive on me. 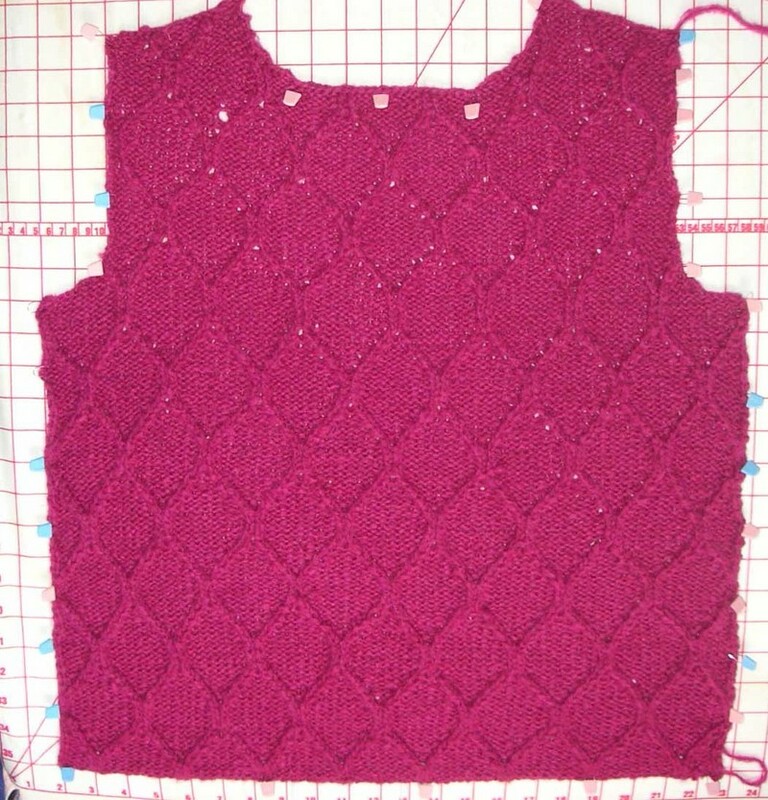 The fuschia was the only color of which there was more than a couple of skeins in stock, and I thought I liked it so I bought a few skeins with the idea of making a vest. 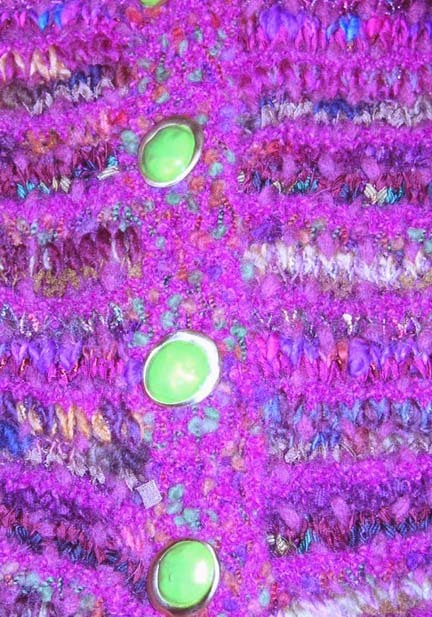 As I knitted the vest I realized that I really hated the color knitted up; it was much too vibrant and strong, still, since George had picked the yarn I didn’t want to totally abandon the project so I started thinking about what other options were available. Needless to say, weaving in the ends was a daunting task and it took me six hours to finish just that portion of the sweater. 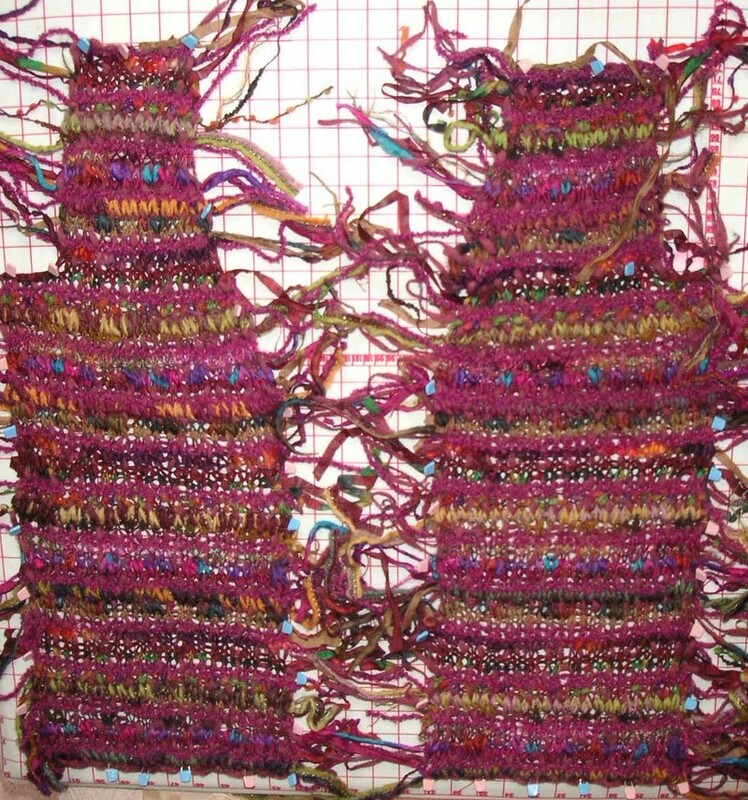 Even then, I did not weave in all the ends, but used a technique of knotting and making a short fringe, as discussed in Montse Stanley. 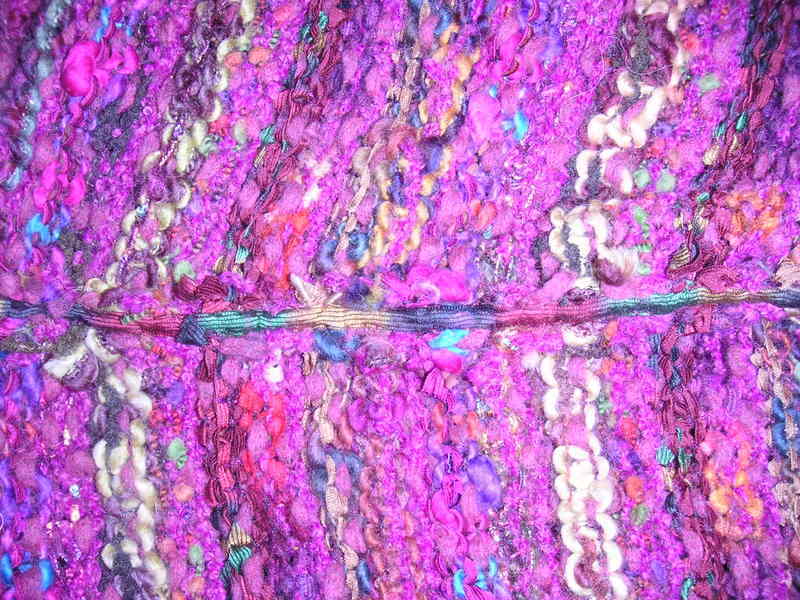 I also sewed a piece of one of the ribbon yarns used over the piece over the seam allowance on the fringed seams just to keep things flat, neat, and well secured. It also took me a long time to settle on the button band. I swatched many combinations of the component yarns before I found the perfect combination, using the Alpaca Boucle and this pretty bobbled yarn. I have no idea what it is. The button band ended up being the perfect finishing touch, especially since I already had the perfect buttons. In order to claim her rightful place she had to evict Aiko, who had been claiming the board for far too long, mostly because of seamstress neglect. Of course, Matilda is still wearing Wine&Roses, waiting for me to weave in those ends. I have managed to walk by her every day and note that the ends need weaving but make no further effort to do so. The moment of truth has arrived; I need to finish something. I cannot, in good conscience, start a new project while continuing to ignore the growing pile of "someday sweaters". Which one will be finished first? It's hard to believe that this sweater is actually going to fit, or look good. It almost looks like there is half a body in there already, especially in the sleeve, which seems to have a life of its own. This picture on the carpet has no relationship to reality. Does this fit a human (yes) is the arm too narrow (no). Will it all work? Well, I believe so as I have been trying it on as I go. Of course I still have all the ends to deal with but I am growing much calmer about the prospect. Right now it is just the seaming that is slowing down my progress. There is so much "spaghetti" to work around that I have to be pretty meticulous in the seaming, not something I always feel like fighting my way through at the end of the day. I finally made a decision on how to proceed with Wine&Roses: I am using a seaming technique from The Principles of Knitting by June Hemmons Hiatt. I can't post a link to the actual instructions and the book is out of print. I am appalled at how much copies of this book are selling for on Amazon.com ($225.00 and up). It is a great book, but not for beginners, and June Hiatt is extremely opinionated, but then, aren't we all? Still, whenever I am not sure what to do in a given knitting situation, she always provides food for thought, if not an outright solution. I have not used this particular seaming technique before, but so far, I ABSOLUTELY LOVE IT! The sweater is pretty bulky and the actual guage varies row by row, but the seam is flat and small and quite attractively almost invisible. The pieces are seamed right-sides together, and sewing up is actually a bit of a challenge because I have to get all those loose ends out of the way and try to detrmine the difference between the actual selvedge stitches and the knots tying the yarns together. (Yes, Virginia, there are knots). As you can see the edge is a tangle of yarns and it is quite difficult to see where I am working, of course my eyesight is not great in the best of circumstances. The good news is that it is equally hard to find the seam once it has been sewn. Can you see the seam? The stripes on the sweater are horizontal. The picture is not. As you can see, the ends are still hanging free. I haven't completely decided what to do about them yet, but the seams look pretty nice, even with the ends still attached. 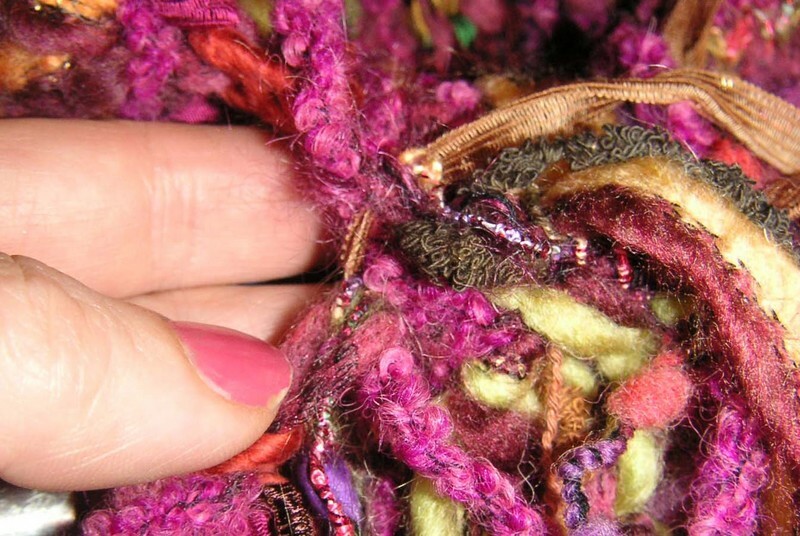 Montse Stanley, in The Knitters Handbook recomments knotting the yarns and leaving a short fringe as one of the alternatives seam finishes. Originally I thought this would be far too bulky in this sweater but I am beginning to revise that opinion. A short fringe might be quite attractive. I might just tack the seam and fringe edge down lightly with a little hand sewing just to keep everything under control. Or I might still work out some other way to deal with the ends. I still have a lot of seaming ahead so there is plenty of time to make up my mind. I am still in San Francisco and not much knitting is happening here. However the sewing week ended last night and I thought I perhaps had more patience and down-time to connect and update you on my progress. The high-speed internet connection is still not working in my room but I perhaps have more time now that I am not rushing up to either the sewing room or to dinner, and thought I could work through the more tedious telephone connection. As you can see, there are many ends to weave in. 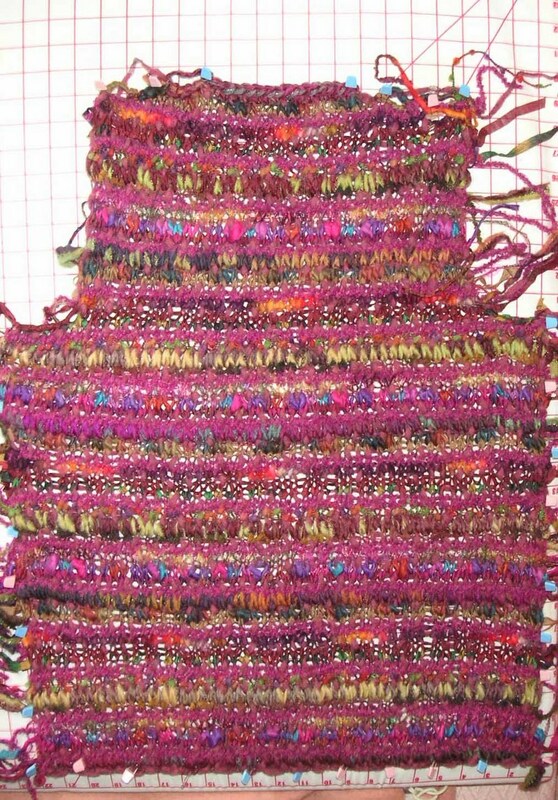 I have been thinking about the ends and realize that weaving in will be somewhat tricky because of the blend of fibers, some of which are quite ravelly and will have to be knotted. There might be some way to knot them together and then deal with the ends in a decorative but still flat and neat way. More research will be required when I get home. I have made a little progress on Aiko, about 3 1/2 inches up into the sleeve shaping. I might finish the front before flying on Tuesday, when I will start the sleeves. Most of this was knitted yesterday in the van while Dan drove our sewing group around the bay area for some fabric shopping. 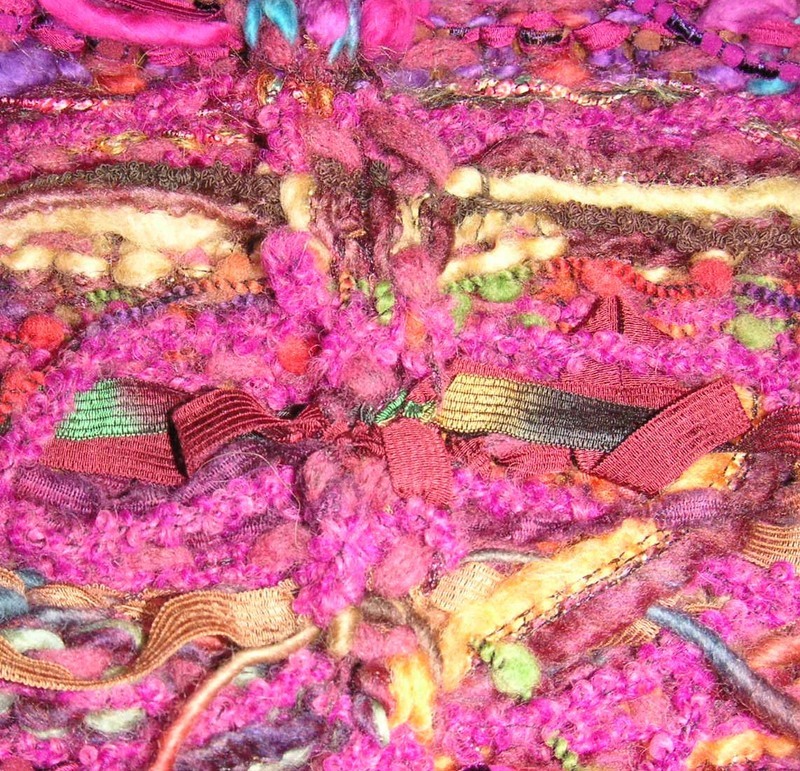 Tomorrow I will go to ArtFibers and I will update you on all the wonderful details. Last week was a really stressful week, with computer problems in the office requiring me to work late every night. Needless to say a lot of knitting was not accomplished. 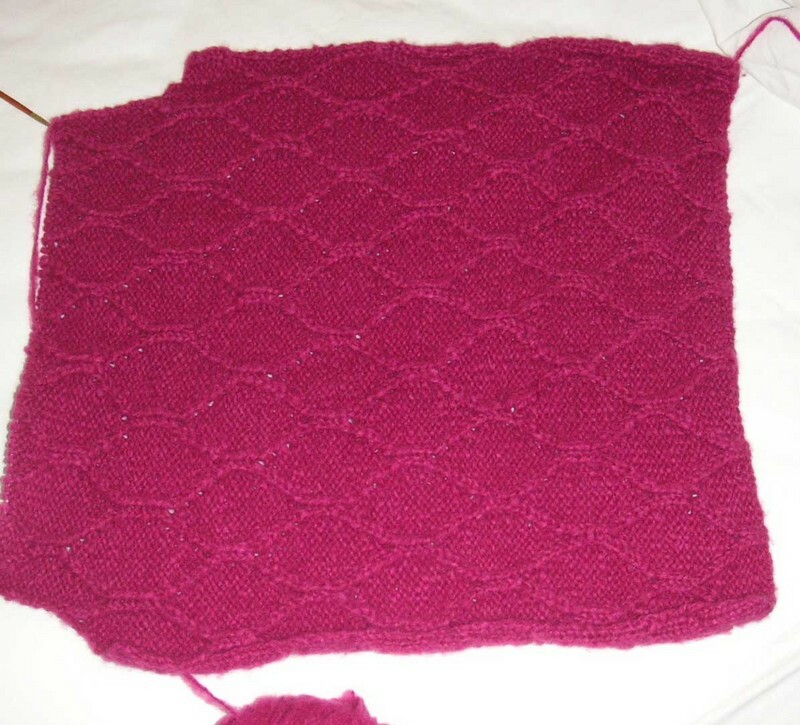 I did finally block the body of the Wine and Roses cardigan, although I only knit about 4 more rows on the last sleeve. I was too tired in the evening to even manage selecting the next yarn in the sequence. I did work on Aiko on my flight to San Francisco yesterday and had an interesting time frogging a section on the little turn down tray table they provide on the plane. The front is completed up to the beginning of the armhole shaping so it is progressing nicely. My San Francisco trip is really a sewing week and I don't usually get a lot of knitting done while I am here, but I do hope to post a picture of the progress on Aiko soon. Otherwise, the only knitting related activity for this trip will probably be a visit to Art Fibers, a really neat yarn shop a few blocks down Sutter from here. They have a really unusual yarn selection and I will keep you informed if I pick up anything really interesting. Hopefully by that time the ethernet connection in my hotel room will be working and I can post pictures. 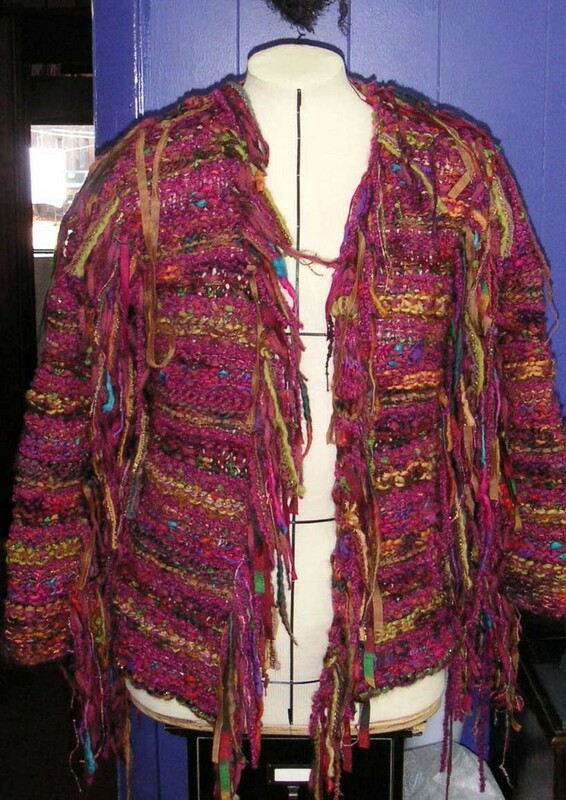 It is really a simple sweater, knit side to side with short rows at the bottom to form the godets. 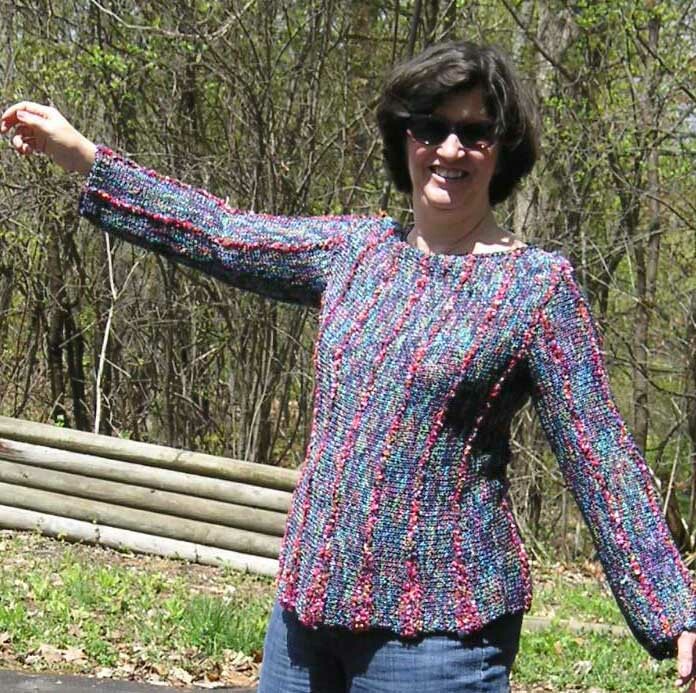 The pattern called for the same short-row shaping at the sleeves but I left it out as I have a very annoying habit of dragging sleeves through just about everything. I like these straight sleeves much better. The little bit of flare and curve at the hip caused by the short rows adds a very feminine bit of flare to the top. Putting it on brought on a definite "I feel pretty" moment and that, combined with the belated appearance of a little sunshine, inspired a little spring dance. I pulled out the cardigan knit from pink and wine leftover and miscellaneous yarns, which I had dubbed "Wine and Roses"
and worked on the last sleeve. 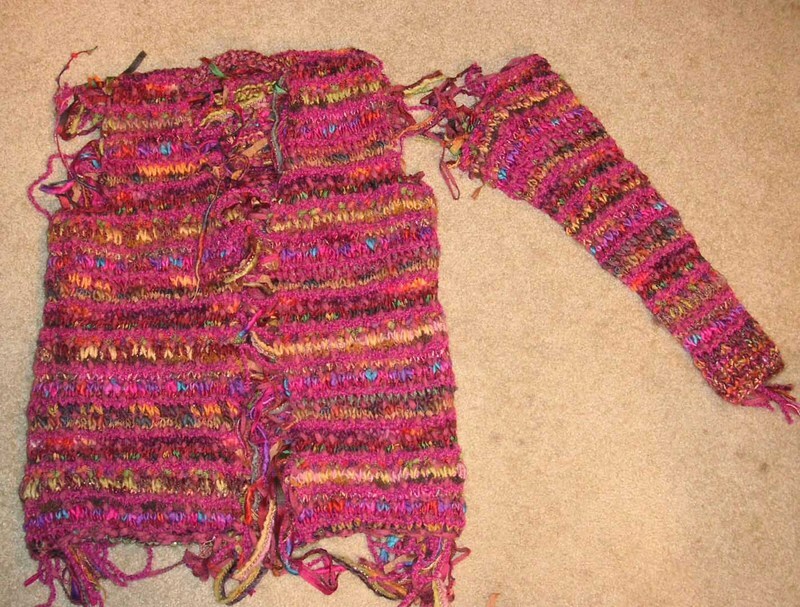 I had just started the sleeve when I put it aside; I had knit about 15 rows. I finished the first stripe sequence repeat, now about 35 rows including the cuff, and the sleeve is a little over 1/3 done, the photo is misleading because I really zoomed in to see as much of the yarns as possible. It really doesn't take a long time to knit as the guage is fairly big, but changing yarns every row slows the process down, not nearly as much in the knitting as it will in the finishing. I hope to get the body on the blocking board today, so I can finish the second sleeve and get the sleeves on the board before I leave for San Francisco on Saturday. I really don't imagine that I will be wearing this before fall, so there is no real rush to finish other than to get it out of the way. Finishing will take some time as some of the novelty yarns tend to ravel and care will need to be taken with ends and finishing. Luckily there is a lot of wool to help hide the more "high maintenance" yarns.